As the percent of online sale grows and as the line between web and traditional retail store fulfillment blurs, e-tailers and brands need to assess their fulfillment capabilities and those of their 3PL warehousing partners. Efficient omni-channel distribution will be a requirement, not a nice-to-have, in the very near future. Watch this video to see how KANE handles fulfillment for companies with multiple sales channels. To make sure you are choosing the right distribution partner, here are 5 tips to consider. 1. Co-locate inventory for B2B and B2C channels and manage it using a single system. By replenishing pallet, case pick and each pick areas from a single inventory pool, you keep your fulfillment costs, and your inventory, as low as possible. Maintaining your inventory on one system facilitates buy online/pick up at store -- the largest sales growth opportunity for retailers and brands. Some 3PLs are very good at regular, predictable fulfillment volumes, but they have a tough time managing unanticipated volume spikes without a disproportionate increase in time and costs. They may not have a good solution for temporary labor, or perhaps their systems aren't up to par. In omni-channel distribution, you need to be ready for anything, like flash sales from a QVC airing. Discuss this key requirement with prospective 3PLs until you have a comfort level with their process and capabilities to efficiently handle large volume swings in the fulfillment center. When demand is such that it requires expansion beyond the current footprint, can your 3PL scale with you and offer additional locations? The fulfillment industry is still dominated by smaller, single-location sites that may not be able to support your businesses as it grows. Omni-Channel distribution requires a flexible 3PL operating environment, equally capable of manage bulk distribution and pick and pack operations for eCommerce and direct sales. The processes used for bulk versus direct-to-consumer are very different. Beware of 3PLs who lack the experience you need in B2C fulfillment. Seeing is believing. 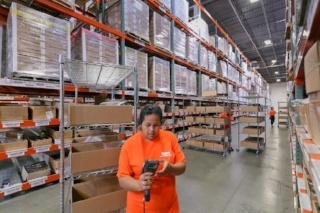 Visit a 3PL fulfillment warehouse that serves clients whose needs and volumes are similar to your own. That way you'll get a sense of how your account might be managed. Knowing where your stuff is -- obviously that's a critical requirement for omni-channel distribution. You need real-time visibility to all your products, whether they sit in a distribution center or at a store, to make decisions on where to place inventory and the location you will use to fulfill specific orders. If you plan to use a 3PL, test out their visibility tool to see how easy it is to use. Also, understand the frequency with which the WMS is updated.